This past year we finally broke down and bought a new car. We spent a year looking at the one we wanted. Weigh all the pros and cons and ended up buying a brand new 2015 Toyota Highlander. It’s not frugal but it makes sense for our family and honestly I love it. We haven’t enjoyed a new car in a very long time (over 10 years). Also looking at used the numbers just didn’t work for this particular vehicle. 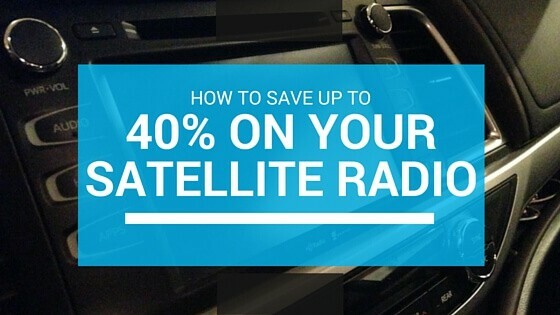 Along with our car came a free trial of Satellite radio. Great! I thought sarcastically. Another monthly payment. As you may have guess not a big fan of monthly or yearly payments on something. Especially as a music lover I usually go with what is on my iPhone and it’s carefully curated playlists. My wife, however, loves the new radio set up. After the trial came up I called them to see about extending. Since it was my wife’s car and we were about to go on a 3-week road trip we decided to use some of our travel money towards this. Speaking to the customer service rep I was given a price of $100 a year plus fees and taxes came to around $112 for a year. We went back and forth for a while and I managed to get him down to $5.99 for 3 months. Not a huge success but a dollar in my pocket is better than a dollar in theirs and, given the 15 hour day drives that were ahead of us on our road trip, I was ok with my negotiation. Did he just say that and give me the keys to the kingdom? I politely thanked him, now feeling that my “Deal” wasn’t quite as good as I originally thought and decided to think about that. Three months came and went, the road trip was great, it was nice not having to search for channels in every town. But my expiration was 2 days away. I decided to call and do a test run on this and see how it went. The customer service rep didn’t move too much for me. Same old starting point $100 for the year. In fact I couldn’t get him to the last price I had received. He said that there were no specials and that this was all he could offer at this time. I thanked him, told him I would discuss it with my wife (as all good spouses do) and would call back tomorrow. All the time I kept thinking I had heard it wrong, maybe there was no magical deal. I spoke to my wife and we decided that we would not go any more than 5 dollars a month or else I would cancel. The next morning, the day before my contract expired, I called the Radio station to cancel my service. They offered me $100 for the year plus taxes. Again the rep had a talk with their manager and came back. You need to be confident that if this doesn’t go your way you will cancel your membership. Just because it’s worked once doesn’t mean it will work again. Though several others I know have tested this out and have had the same $3 a month experience. If you try let me know below how it works for you. Post a comment and let me know. Happy Savings! Similar story here. When I found out the my mother had received a much better rate, I immediately called – it happened to be near the time I was scheduled to renew – and threatened to cancel my membership if they didn’t give a reduced rate. Worked like a charm. As you note, you have a lot of leverage if you are really prepared to cancel, which I am, if I cannot continue to get a stellar rate in the future. I agree SavvyJames. You need to be ready to walk away. They will tell you that you will have to pay a “fee” to start back up again. I just reply, “I’m pretty sure that if you want me back you will find a way to waive the fee”. When you are paying for something you definitely have some leverage. Always be willing to use it. 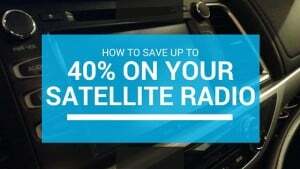 I never knew of this, I was on auto-subscribe when I had satellite. I no longer have that vehicle or the need for satellite right now. Although I had a similar thing with a credit monitoring service that was offered through my bank. 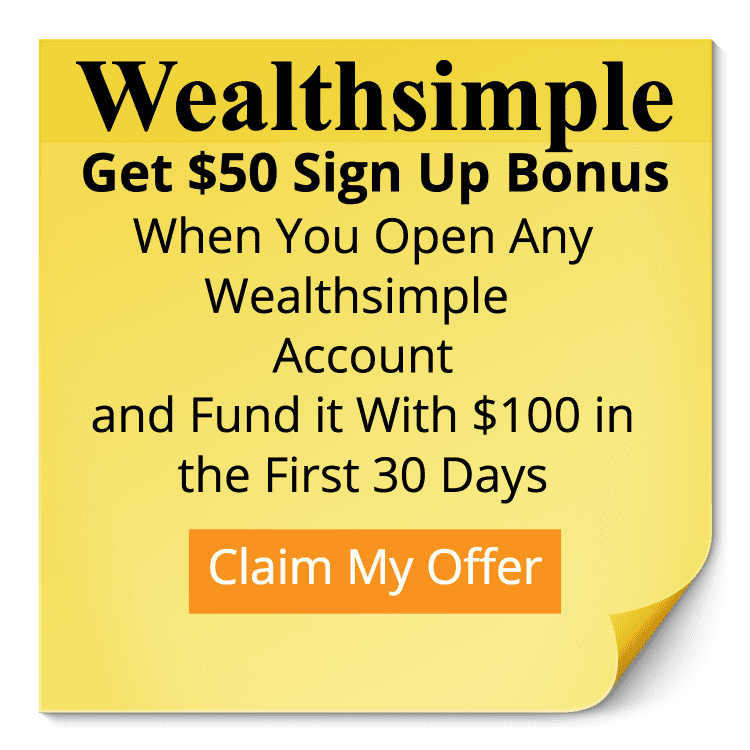 I called to cancel & they offered a reduced rate for 6 months ($13/month reduced to $6/month) or there was a free monitoring service as well where I still had access to unlimited credit reports for a year. That’s an awesome tip Josh. Seems like a lot of places get that it’s better to have you at a reduced rate than to lose your business all together. Found out from Family Money Plan that I could call the day or a couple of days before my two radios automatically renewed with the auto renewal rate would be $340 for the year for two radios. 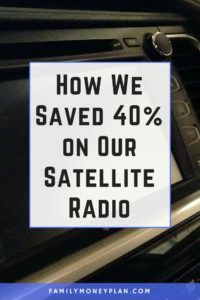 I called with the intention of canceling my membership because the rates were so high and last year the two radios cost over $300 for the year. This year it would be $340. So, I called to cancel and ended up getting five months for both radios for $60! I have put a reminder in my calendar to call a couple of days before the radios automatically renew and I will do the same thing and get another great deal. That is awesome news David! I’m so glad you were able to use this. That’s nearly $220 bucks in your pocket over the next year for a 5 minute phone call. Way to go!